Republic of Ireland skipper Seamus Coleman is facing a spell out with a stress fracture in his foot, boss Martin O'Neill has confirmed. The 29-year-old Everton full-back suffered the injury in Thursday night's 4-1 Nations League defeat against Wales in Cardiff, but he remained with the squad and travelled to Poland for Tuesday's 1-1 friendly draw. Seamus went for a scan. He has a little stress fracture, which is a concern. He could easily have got a flight home, but he stayed with the team. 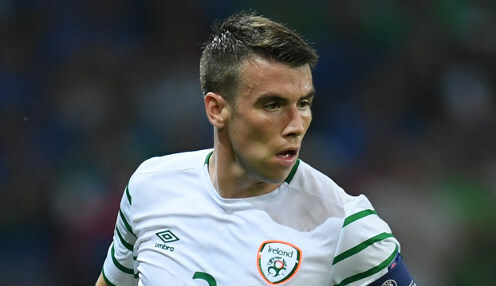 And, speaking after Mateusz Klich's late equaliser denied his side a win after debutant Aiden O'Brien put Ireland ahead in Wroclaw, O'Neill told RTE Sport: "Seamus went for a scan. He has a little stress fracture, which is a concern. He could easily have got a flight home, but he stayed with the team. Coleman, who missed 10 months of action after suffering a double leg fracture in a 0-0 World Cup qualifier draw with Wales at the Aviva Stadium in March 2017 is facing more time out of action for Everton. However, O'Neill will hope he is fit enough to return for their Nations League double-header against Denmark and Wales in Dublin on the 13th and 16th October. The Republic of Ireland are 12121/1 to win the Nations League League B Group 4, while Wales are priced at 12121/1 and Denmark are 1/10000.